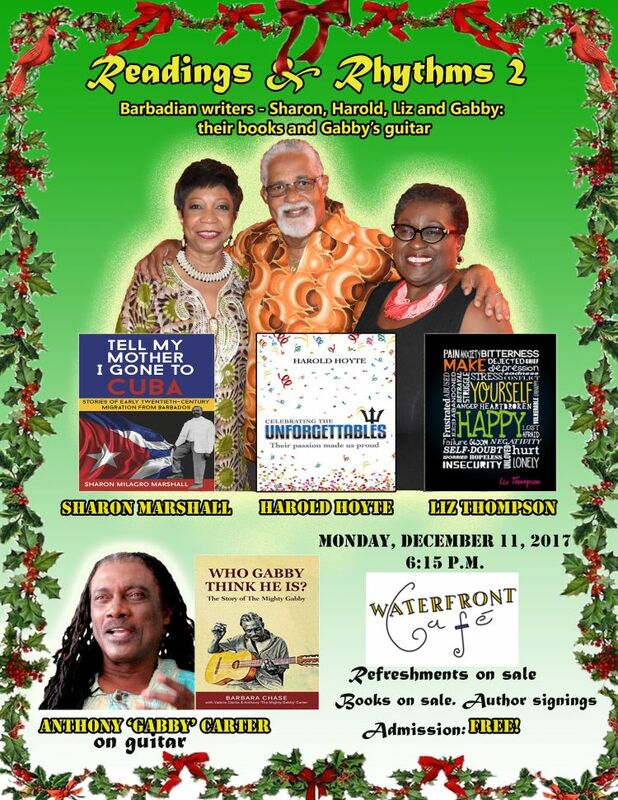 Barbadian writers - Sharon Marshall, Harold Hoyte, and Liz Thompson - return to the Waterfront Café to reprise their successful Readings & Rhythms Readings at The Waterfront Cafe held back in March this year. 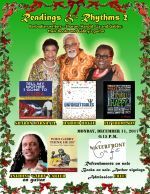 The featured books will be Make Yourself Happy (by Liz Thompson), Celebrating the Unforgettables (by Harold Hoyte), and Tell My Mother I Gone to Cuba: Stories of Early Twentieth-Century Migration from Barbados (by Sharon Marshall). This time, they have company in Anthony "Gabby" Carter - Barbados' foremost folk singer, Cultural Ambassador and multiple calypso monarch. He will be featuring his book Who Gabby Think He Is? and also play his guitar. Thompson, who has published 2 academic collaborative books, is venturing out on her own with this motivational book. She is a Consultant, a former Minister of Government in Barbados, was an Assistant Secretary General of the United Nations and was also a journalist with the Nation Newspaper. Marshall has contributed chapters to 2 published books, and her first single-authored book was recently featured at the Havana International Book Fair. She is a former news anchor and Director of News and Current Affairs at the Caribbean Broadcasting Corporation. Marshall has also served in senior positions in public relations in Barbados and the Cayman Islands. Copies of the authors’ books will available for sale, and they will be on hand to sign copies for patrons. Admission to this event is free, and all are welcome to attend.